This article is based on introductory remarks made in opening the Class Actions Seminar held at the UNSW Law CLE Seminar in Sydney on 22 March 2018. Embarking on a class action involves a number of key issues. This article discusses a practical approach to the provisions contained in Pt IVA of the Federal Court of Australia Act 1976 (Cth). Security for costs has become a controversial issue in class action litigation. 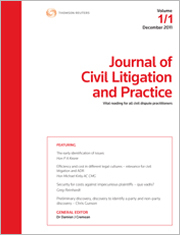 This article reviews a number of recent cases and some problematic aspects of successful orders for security for costs which have resulted in the narrowing of the class or the termination of the litigation when class members (who are otherwise immune from any adverse costs order at the conclusion of the proceedings) have declined to contribute sufficient funds to meet the amount of security ordered to be provided. Reference is also made to the relevance of litigation funding and after the event (ATE) insurance policies in the exercise of judicial discretion in relation to security for costs. Competing class actions, particularly in the area of shareholder claims, are becoming more common but are undesirable as they increase costs. Class actions are designed to allow for the sharing of costs and economies of scale. Allowing more than one class action to be brought means that efficiencies are lost and costs are duplicated. This increases the burden on defendants and courts, but perhaps most significantly, the greater costs may reduce the compensation available for group members. This article suggests certification as a solution to the competing class actions problem. As the Australian Law Reform Commission undertakes its enquiry into federal class actions and the litigation funding industry, it is important to consider judiciary-led suggestions for reform. In this article, the authors review a range of recent law reform topics addressed by Lee J of the Federal Court of Australia in Lifeplan Australia Friendly Society Ltd v S&P Global Inc  FCA 379 with a view to developing and critiquing those topics with reference to the academic literature. His Honour’s reasoning directs attention toward the role of economic efficiency in guiding the exercise of discretion under Pt IVA of the Federal Court of Australia Act 1976 (Cth), the use of court appointed independent cost assessors and settlement administrators, the role of objectors to class action settlements, payments to lead applicants and non-publication orders. For the PDF version of the table of contents, click here: JCivLP Vol 7 No 1 Contents. Posted in Journal of Civil Litigation and Practice (JCivLP), Journals, Update Summaries | Tagged "This is Who I Am and This is How I Want to Look", after the event (ATE) insurance policies, Australian Law Reform Commission (ALRC), Class Actions Under the Spotlight, class actions: historical highlights, cost effectiveness and case management in class action settlements, Editorial, JCivLP, John Basten, Lifeplan Australia Friendly Society Ltd v S&P Global Inc  FCA 379, litigation funding, Michael Legg, Nick Beaumont SC, Peter Cashman, Pt IVA of the Federal Court of Australia Act 1976 (Cth), Roderick Joyce QSO QC, Samuel J Hickey, security for costs in class actions, UNSW CLE Seminar "Class Actions – A Close Examination of the Key Issues"